When I heard that my supplier was dropping my favorite driver from its lineup, I bought 4 at a good price. Since they are currently sitting around doing nothing, I thought I could use a pair of them in conjunction with my existing sub to get an extended bottom end. A pair of "Buddy Subs" in series, placed in parallel with the Blast Furnace gives a total load of 4 ohms, which utilises the full 350w that the amp can deliver. According to WinISD, extension to 17hz can be attained with 110 litres, 19hz tuning. 6 metres of 250mm PVC pipe was left over from the abortive concentric port experiments, so some of the enclosure volume was made up using the pipe, giving an interesting box without spending heaps. 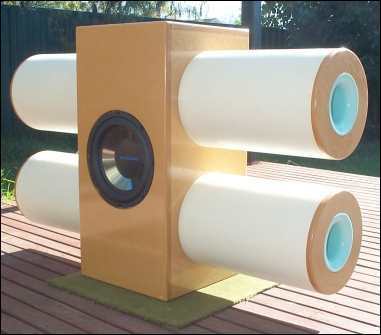 Four capped sections of pipe make "extension pods" which open into the box. A pair of 86mm ports exit from the pods on one side. Whilst one sub is left firing and one is right firing, they can be inverted, mounted side by side, or stacked, giving plenty of flexibilty for positioning. A favorite location is to deliver the infrasonics straight into the corners of the room! With everything cranked up, I have measured 107dB at the seating position for the famous Bath scene on the 'Constantine' DVD.- Finally met THX specs! The graph is actually of a single box with 4 drivers / 350w amp, 350litres, 19hz tuning. I do believe that in excess of 105dB @ 20hz qualifies for THX certification. Just over 100dB @ 15hz isn't too shabby either! I read somewhere that the resonant frequency of the human eyeball is around 19hz, so if any "ghosts" appear, I'll know where they came from! Both ends of the ports were originally flared by 10mm using a rollover bit in the router. Since building these subs, I have conducted some flared port experiments and found that, for the 9.7 m/sec airspeed generated, a flare of 10mm is too small. As this Flare-it screenshot shows, there is only a small problem area below about 22hz when operating at full power. Recently the drivers were temporarily removed for a test project, presenting the opportunity for some maintenance. The flares on the port exits were upgraded to 25mm heat molded. The small smoothing rings originally fitted to the ports were replaced by larger donut style rings, providing 13mm flared intakes. See the gallery for more detail. There's been no "chuffing" since.